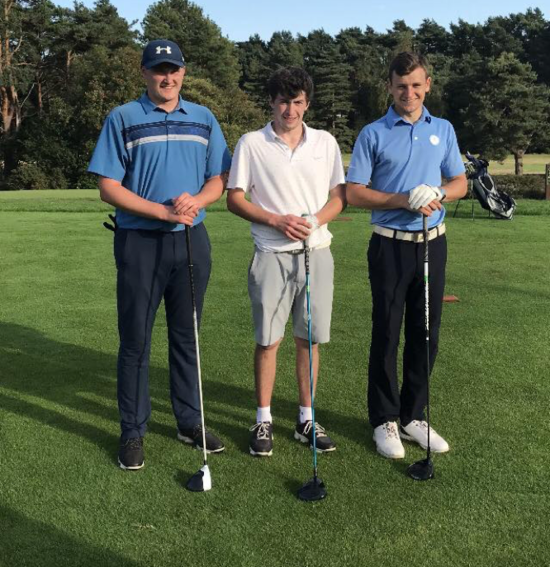 On the 19th of August, myself Joe Swaine and George Harvey undertook the 72 holes in one day challenge to raise as much money as we could for Macmillan cancer research, and the Captain’s charity. We would all like to extend a very big thank you to everybody who either sponsored us for the event or helped us round and kept us motivated and upbeat either by walking round with us at some point during the day, bringing snacks out to us on the 9th, or by letting us play through your group on the course, we were very grateful as it certainly helped. We started the day at 6am and all three of us were raring to go. The first tee shot of the day went to Joe, who knocked his shot down the middle and left himself a nice flick with a wedge onto the green from around 100yds. George went next and hit his down the right side of the fairway, and left himself a nice 9 iron into the green. However, I decided to visit the bunkers both with my drive and my second shot and ended up with a double bogey on the very first hole. It did thankfully get better from there though! The second round was better as we were all warmed up from the first round but had to put up with some drizzle that lasted a few hours and certainly tested our mental strength, but we powered through it and came in with a better combined three ball score than the first round. The sun thankfully decided to come out in the third round, it warmed up a treat and lasted the rest of the day which resulted in perfect golfing weather and our scoring started to pick up because of it. The final round we were buoyed on by the thought of it being the home stretch, and we all hit the fairway with our final tee shots of the day, Joe making a par, George doing the same and myself making a birdie. The last nine holes went off without a hitch really, we were let through by the juniors playing in their Captains’ day, and ended up finishing around 8:15/8:20pm, with the bar and around 10-15 members watching us play the last hole being a nice welcoming sight after playing golf for approximately 13/13 ½ hours in one day. Once again, a very big thank you to everybody who helped us in anyway on the day, your support was greatly appreciated, and we hope to receive your support again next year when we hope to undertake this event again. For those of you who have sponsored us but have yet to pay, if you could do so at your earliest convenience in the pro shop, we would be grateful. (953 /3) * 4 = 1271.